Dvořák Stabat Mater keynote of the 2017 Dvořák Festival at the Rudolfinium, Prague. 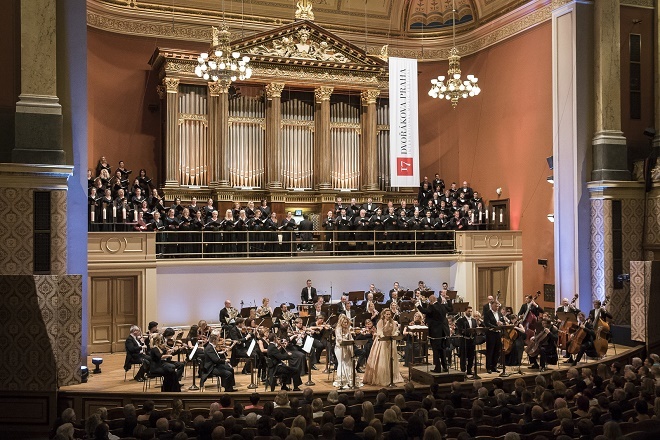 Emmanuele Villaume conducted the PKF Philharmonia, Prague, with the Czech Philharmonic Choir, Brno (concertmaster Petr Fila) and soloists Christine Opolais, Jana Kurucová, Richard Samek and René Pape. Outstanding singing - even better than on the recent recording where Jiří Bělohlávek conducted the Czech Philharmonic Orchestra and Prague Philharmonic Choir. (read more here) Bělohlávek founded the PKF Philharmonia Prague in 1992 after he left the Czech Philharmonic The two orchestras thus had parallel lives. Bělohlávek never really left the Czech Philharmonic, and became Chief Conductor again in 2010, heralding a new golden age for Czech repertoire, both in Czechia and in the UK. The PKF Philharmonia Prague continues to thrive.Bělohlávek remained Conductor Laureate. The PKF has a slightly different profile and leaner, lighter sound. But both orchestras honour Antonín Dvořák, whose statue stands facing the Rudolfinium as if he were a guiding spirit. The surging, swelling motifs in the first movement set the affirmative tone. Though the term Stabat Mater refers to the Virgin's Mary's grief as a mother on the death of her son, in theological terms it's a contemplation on faith. Dvořák's Stabat Mater is sorrowful, but ultimately uplifting: the devout believe in the resurrection of the soul. Thus the surging thrust that runs through the piece, the choir entering with "Stabat Mater!" in hushed tones. While Bělohlávek shaped the pulse so profoundly that it resonated like the rhythms of a human body, Vuillame has the edge with far better singers. Richard Samek, the tenor, was superb. He impressed in Bělohlávek''s Dvořák Requiem earlier this year (read more here)r His voice has a Helden ring, yet conveys depth and tragedy : when he sang Dalibor in 2015, he created the complexity in the character. (read more here). Samek's voice was well complemented by that of Kristine Opolais. She's a brilliant Rusalka, the silvery clarity of her timbre enriched by tenderness and sensitivity. The women she portrays in her roles end up suffering. An inspired choice for a cantata about the Virgin Mary, whose son must die for the good of mankind. .
Further depth was supplied by the richness of the voices of Jana Kurucová and René Pape. 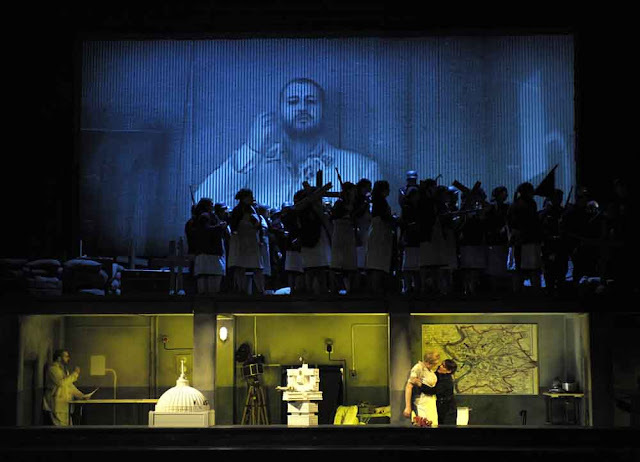 Kurucová is relatively young, but interesting, while Pape is of course a mega star: luxury casting for a cantata. He's magnificent, the authority in his singing adding depth to all around him. This Stabat Mater is worth hearing for him alone, he's so good. Excellent balance between the four soloists, and between the soloists and male and female voices. The Czech Philharmonic Choir of Brno are very good indeed. Bělohlávek's Dvořák Stabat Mater is better orchestrally and the singing was fine, but the singing in this performance is in a different league, making this a Stabat Mater to remember. "Amen ! Amen !" the choirs and soloists sang in multi-layered filigree, while the textures in the orchestra softened to rapturous wonder.